The touch screen responds easily to a steady press of the finger. Do not press hard on the screen or use sharp or pointed objects as the screen may become damaged. Touch, or press, to select an item. The selected operation is launched and the next item is displayed. Press to select a setting item that displays a slider bar. Slide finger along slider bar in the desired direction to change setting. Release finger to change value accordingly. Press and the previous screen will be displayed. Press at any time to return to the Home screen. Press APPLICATIONS for information on fuel economy, maintenance, to verify warnings, and more. Press ENTERTAINMENT to operate audio sources, such as radio, CD, and more. Most recently used audio source is displayed, press again to change. 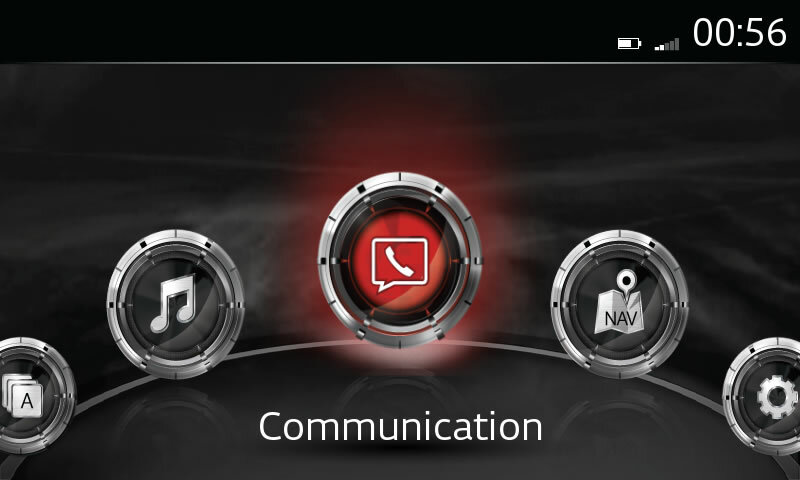 Press COMMUNICATIONS to make calls, send text messages, and perform other Bluetooth®-related functions. Press NAVIGATION to display Navigation screen. Press SETTINGS to access Settings menu for AD-DISP (Active Driving Display), safety, sound, Bluetooth®, language, and more. – For safety reasons, touch screen operations are disabled while the vehicle is in motion.